My first Polish football weekend was long overdue. Having loved the country on half a dozen non-football trips over the years, and taken in a match in Poznań during Euro 2012, it was high time to see the domestic game in action. So after persuading my brother to join me, we boarded a Wizzair flight from rainy Luton to a very sunny – yep, honest – Katowice in southern Poland. It was a three game schedule. Ruch Chorzów on the Friday evening, Górnik Zabrze on the Saturday afternoon and over to Cracovia on the Sunday lunchtime. 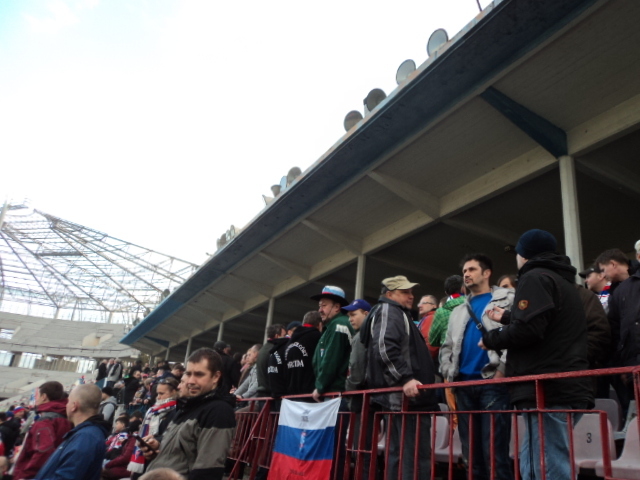 Our steep learning curve regarding watching Polish football began right with the first game, Ruch Chorzów v Widzew Łódź. The plan was to get to the ground early to sort out the Fan ID (which is required at all Polish top-flight stadia), around 4pm for the 6pm kick off. So we asked around for the right tram to get to the stadium in Chorzów. 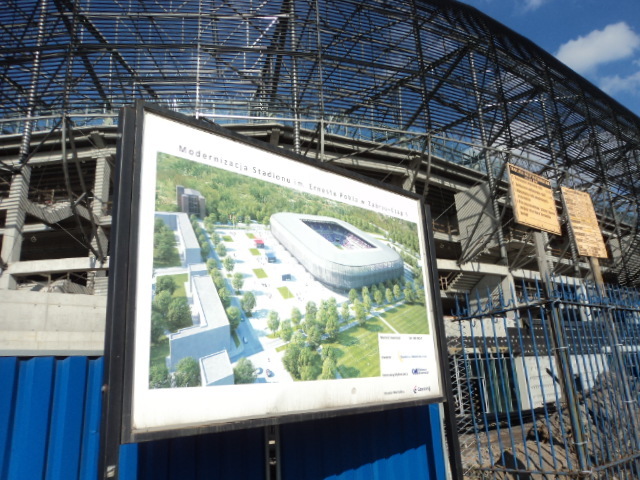 It was only when we were three quarters of the journey along that we realised we had been directed onto the wrong line to the half rebuilt Stadion Śląski (Silesian Stadium) on the other side of Chorzów. Still, at least it gave the opportunity for the first stadium picture of the trip. My vague memory of checking a map before the trip recalled the Ruch Chorzów stadium was down a road due south from there and it didn’t look far away. Of course maps are often misleading, and by the time we had gone the wrong way via a wasteland of old dumped fridges and then alongside a dual carriageway, it was getting dark – fortunately the bizarre strips of floodlights of Stadion Ruchu beckoned us to the right place. After another two miles it was 4.45pm and we were there. Now to find the ID place, surely one circuit of a 10,000 stadium would reveal a ticket office or shop within 10 minutes? I can officially confirm that the loop of roads around that ground is one of the longest I’ve done in some time. And after half an hour, and several bouts of asking and pointing, we finally ended up in the marquee ID office and shop – something which had looked like a cafe bar when we passed it the first time. The queue was out of the door, and once we made it inside it barely moved. People were wandering in and out, there were forms flying around and it appeared to be complete chaos. However, bearing in mind the slow moving queues everyone, home and visiting supporters, were surprisingly tolerant – I’m not sure the same would have happened in England. By 5.50pm, 10 minutes to kick off, we were nowhere near getting an ID, let alone a ticket. With a heavy heart we abandoned ship. And to somewhat rub our noses in regarding our problems in getting there, we got the right tram back to Katowice in just ten minutes. Ruch under the lights, unfortunately we couldn’t watch the action! On to Saturday, and there would be no chances taken. We hopped on a mid morning train to Zabrze and, having printed a map off to the stadium, set off on foot. Yes the stadium looked a mile off on the map, I really must learn – as it’s probably nearer two. 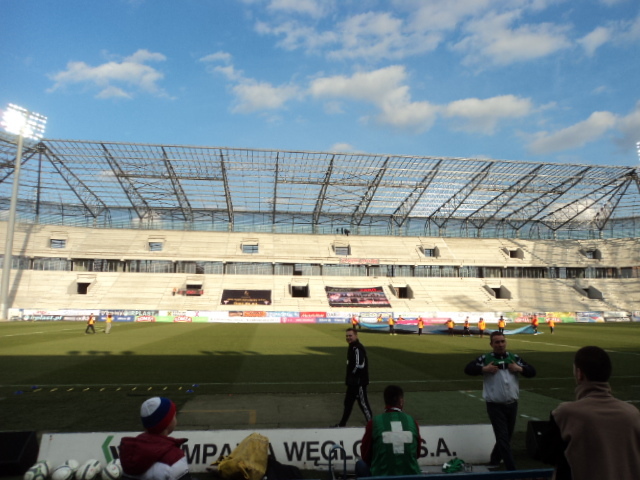 But soon the new, impressively sized half-built stadium reared into view and after a bit more pointing and thanks to a friendly English-speaking girl at the ticket office, we had our coveted Fan IDs and tickets for Górnik Zabrze v Korona Kielce. 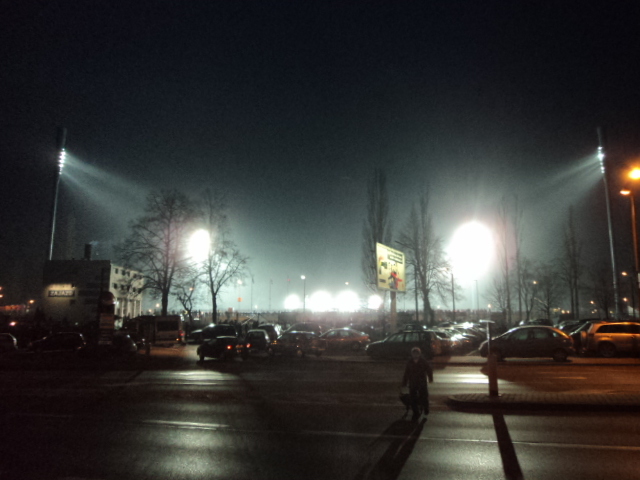 After walking back to the centre, and then back to the stadium via taxi – where are the bars in Zabrze?? – it was one of the more bizarre football experiences I’ve enjoyed. Three quarters of the new two-tier stadium looms empty over the pitch, with all the fans in and around the old stand on one side, all 3,000 of us. It made for a strange, training session like atmosphere. And the fact it was a goalless game probably didn’t help! It did make us wonder how, when the club next season hopes to fill a 30,000 stadium, we were able to pick up tickets on a matchday when capacity is reduced to only 3,000. Górnik as a stadium was certainly a work in progress so the facilities don’t rate that highly. There did however seem to be reasonable food and refreshments on offer but the less said about the state of the portable toilets by full time the better. So one game down, on Sunday we set off to Krakow in search of the trip’s first goal. After confusion at Katowice’s plush new railway station – we were sold a rail ticket but we worked out just in time it was actually for a bus – we hopped on board and were in Kraków in just over an hour. After passing through the medieval main square we set off to Cracovia v Śląsk Wrocław and again sorted out Fan ID and tickets with a minimum of fuss at the easy to spot ticket booths. English was spoken and the staff couldn’t have been more helpful. 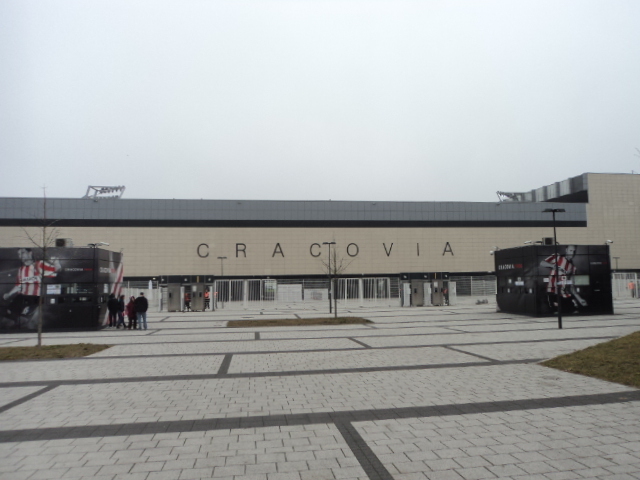 Cracovia’s new stadium is a tidy affair and it’s easy to find your way round. We also found a sports bar which is built into the ground, and a beer and burger set us up nicely to head inside. However, our turnstiles were next to the away end and this was my first experience of Poland’s handling of travelling fans. I’ve seen some heavy police presences at games, in Germany, Switzerland, Netherlands and the Czech Republic, but nothing to top this in terms of numbers. 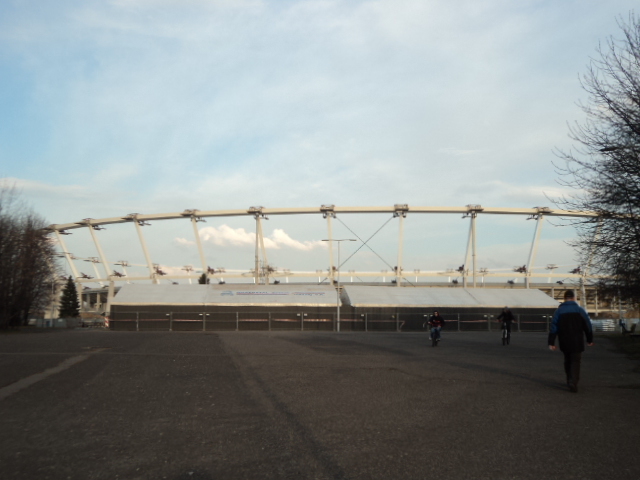 Dozens of police vans, and more than 100 armed riot police, surrounded the away entrance and security pen which contained about 500 visiting fans. The Polish police don’t mess around! It seemed over the top at the time, and reminded me of English policing in the 80s that saw all football supporters demonised. But this was just a couple of hours before the riot in Legia Warsaw’s ground. I understand what was going on a bit more now. Inside the stadium the facilities were easily the best we had seen so far, a pity the only beer on sale was non alcoholic – was this because it was a high security game or was it due to a total ban? Our seats, setting us back just 25 złotys (around £5) as they were on Saturday, put us right on the halfway line with a great view. The 15,000 capacity ground was half full but the noise was still impressive. And the orchestrated, double drum-led fan army in the home end really got the atmosphere going. Unfortunately their efforts, and those by the team, were to no avail as a first half injury time goal gave Śląsk Wrocław the points. It was a better game than the one on Saturday, and overall was entertaining. It was also great to see very little backchat from the players, and any diving was stamped out by the referee. Perhaps the football overall was around English Championship level – although the finishing did leave a lot to be desired. So the trip ended with three league stadiums visited, two games watched and one goal. It was great fun. Initially it can be tricky working out where to go and what to do – basic signage, even in Polish, seemed to be scarce at times – but you do get the hang of things, and you just need to roll with it. I had hoped that there would have been more of a football buzz in the towns on matchday, in the streets and bars, but there was unfortunately little evidence of that. We also failed to find a bar showing Polish football. Perhaps we were just in the wrong places. But for value – around £5 a ticket, and everything else equally cheap – it’s definitely a worthwhile and interesting trip – a mix of modern day stadiums and throwbacks to England in the 1980s. And I’ll do my level best to be back. This entry was posted in Uncategorized and tagged Chorzów, Cracovia, Górnik Zab, Groundhopping, Kraków, Polish football, Ruch Chorzów, Silesian stadium, Widzew Łódź, Zabrze, Śląsk Wrocław. Bookmark the permalink.